Removal UK to Spain or back will take a long time to organise, and it may seem like an age before removals day comes along. But it will come, and it may well be an emotional time as not only are you moving house, but you are moving country. It�s a big step. What are the very last things you should do before locking up your old house for the final time? Before your removals to Spain you should ensure that your house is cleaned fully, from top to bottom. This will be one of the terms of your tenancy if you are renting. Although this is not a prerequisite for house sales, it is a point of etiquette to allow the new owners to move in to a clean and pleasant house. For rentals, the tenancy usually specifies that a professional cleaning company should be used, and this is a good idea in general if there is time between you moving out and the new people moving in. If there is not � if it is happening on the same day, for example � then you will need to do it yourself. After all, you wouldn�t want to move into a dirty house at the other end. It could also be a good idea to leave some instructions for the new owners or tenants regarding how to use the heating and hot water, for example, or anything that they might have difficulty with such as the oven or shower. 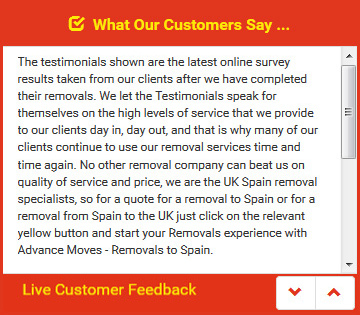 After this, you can begin your removals from Spain to UK or vice versa! Once accommodation is arranged for your new life abroad, removal UK to Spain can be organised. Advance Moves has everything you could need. See our website at http://www.advancemoves.com/ for a quote and information about our different services. Please call us on 0871 218 0612 or email info@advancemoves.com with your questions.